Personalised full colour photo Mens/Gents Wallet. 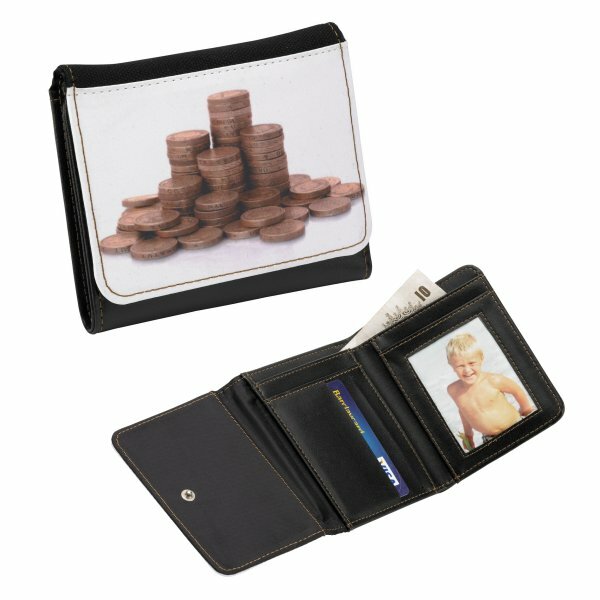 The soft leather type material wallet measures 12cm x 10cm x 1.5cm (12 x 28cm when opened) and has a popper fastening. It also has sections for credit cards and notes. Personalise with your photo/image and even add text at no extra charge. All the printing is done on the front of the wallet. This is a great personalised gift which is ideal for a gift for many occasions including Birthdays, Fathers Day, Christmas, Anniversary.....it's endless!